ST. GEORGE — A cold front expected to pass over Utah Sunday will bring a high chance for snow and gusty winds throughout the state, including parts of Southern Utah. The National Weather Service in Salt Lake City has issued a winter weather advisory in effect from Sunday afternoon through the night in the state’s mountainous regions. Regionally affected communities and points of interest in southwest Utah include Cove Fort, Panguitch, Bryce Canyon, Delta, Fillmore, Milford, Beaver and Cedar City. The cold front will cross the state beginning Sunday afternoon and is expected to reach Southern Utah after sunset, at which time a period of intense snow is forecast in the areas listed above, followed by periods of more moderate snow into the overnight hours. Roads may remain slick or snow-covered and visibility may be low through the overnight hours. 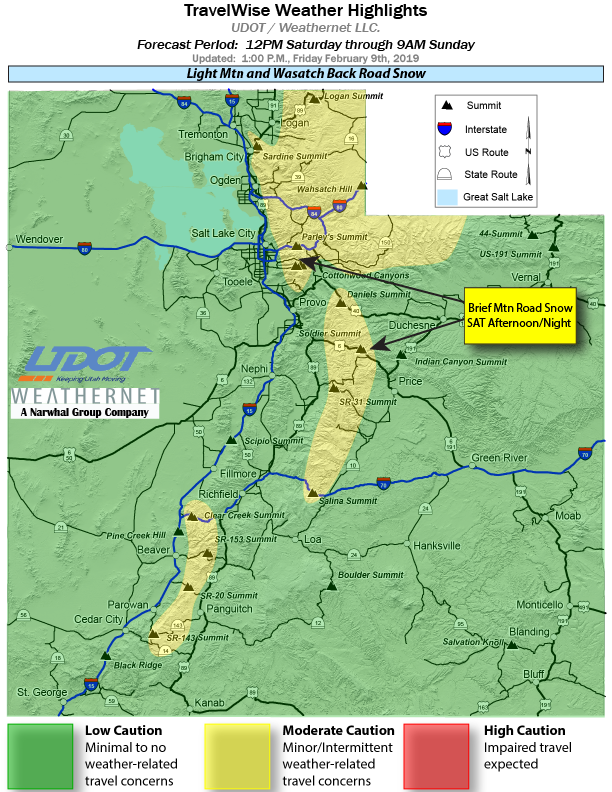 According to the Utah Department of Transportation, some roads expected to be most impacted in Southern Utah include state Routes 14, 20 and 143, from Parowan to Panguitch. The National Weather Service has also issued a Wind Advisory in effect from Sunday morning through the night. Regionally affected communities and points of interest in southeast and southwest Utah include Glen Canyon National Recreation Area/Lake Powell, Kanab, Escalante, Bullfrog, Delta, Fillmore, Beaver, Milford and Cedar City. Southwest winds of 20-30 mph with gusts up to 55 mph are expected to develop in the early- to mid-afternoon alongside the cold front. Winds are forecast to be at their strongest in the late afternoon and early evening before diminishing by nighttime. Strong cross winds may affect travel, especially for high-profile vehicles and those towing trailers. Gusty winds will also cause a rough chop on area lakes, which could capsize or swamp boats. “For your personal safety, operators of small craft are urged to postpone their outings until the winds subside,” the National Weather Service states.